Brackenborough Hall Coach House Self-cateringBrackenborough Hall and Coach House stand in the centre of ancient parkland which is the site of the deserted medieval village of Brackenborough, all part of the 800 acre farm. The sympathetic conversion has retained as many original features as possible, such as the ornate workings of the nineteenth century coach house clock, the winch mechanism to the granary and the herringbone stone floors, as well as creating an attractive and comfortable ambience in a unique building. A holiday at Brackenborough will satisfy all tastes. Activities available include walking, cycling, fishing, nature trails, bird watching, badger watching, children’s play area, tennis on the one acre of beautiful lawns and inclusive guided tours of the deserted medieval village and farm. The apartments accommodate 1 to 12 people when occupied separately, but are also ideal for groups of up to 24 who can enjoy the exclusive use of the entire building. We welcome short breaks all year round! Brackenborough Hall Coach House offers weekly bookings starting on any day and sometimes short breaks. 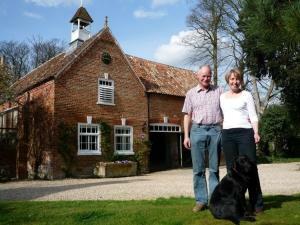 Stables offers weekly bookings starting on any day and short breaks of 1 or more days starting on any day. Leave the A16 on the north side of Louth (following signs to Riverhead theatre) along North Holme Road. Turn left just before the Lincolnshire Co-op, and left at the next cross-roads into Brackenborough Road. After 2 miles (and 5 right-angle bends!) turn left into the entrance to Brackenborough Hall Farm. Continue over two cattle grids, and the Coach House is ahead of you. The Stables were really comfortable and very quirky. We had everything we needed and a lovely welcome by the owners. The location was brilliant with farm grounds that can be wondered around and not far from the coast and lovely market town of Louth.